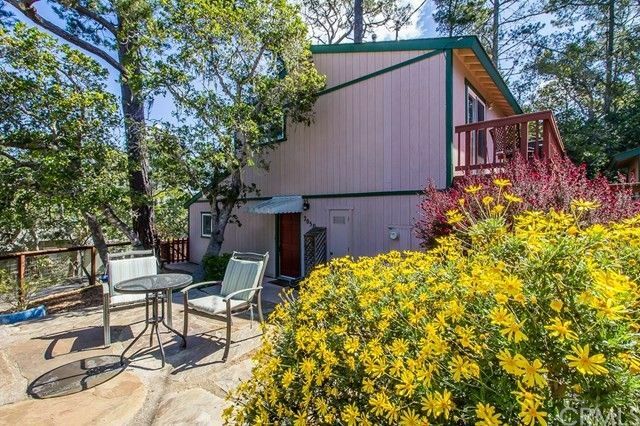 Picture yourself in this sunny and cozy home in quiet area of Lodge Hill. Brand new 30 year roof. And updated with Milgard windows, carpet, paint and appliances in last 2-3 years! Entry hall leads to living, kitchen and dining open plan, a bedroom and bath, and laundry. Large master suite is upstairs includes south facing deck. Move in ready, comfy plan. Flagstone patio on west side, sitting decks on both north and south. To the east is large undeveloped property, providing beautiful oak forest setting. Yard is fenced for your dog. Friendly neighborhood, level-ish for rambling walks including short distance to Fiscalini Ranch Preserve. Come enjoy the forest and mountain views! Call your Realtor today. Directions: West on Ardath from Burton Dr, left on Emerson, right on Dorking, home on corner of Dorking & Dovedale.